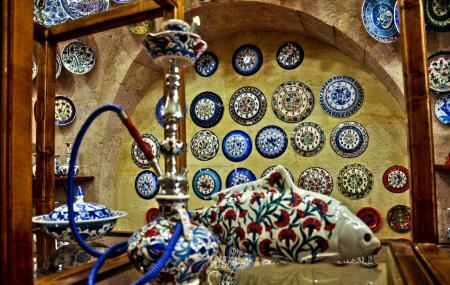 Avanos is very famous for its quality red river clay and clay designs and Guray Seramik is an ideal place to buy such stuff. The gift shop has a magnificent collection of ancient and contemporary ceramics that can be purchased at reasonable prices. Moreover, you can also try your hand at pottery and explore your skills here. You can also watch artists while they pour their skills into the various well designed articles in the form of hand painting. A delightful experience awaits you at Guray Seramik. How popular is Guray Seramik? People normally club together Galeria Chez Galip and Kapadokya Jet Boat & Gondola while planning their visit to Guray Seramik. Avanos is very famous in Pottery. So when you come with tour, they will guide you to some pottery factory. I was visited Guray Comlekcilik Seramik, and saw some of the pottery making process like "Ghost" movie. A member of our group even had the chance to try her hands at the pottery wheel. If you like to enjoy, should volunteer to wheel it. Good experience. As well as the wonderful painting techniques.